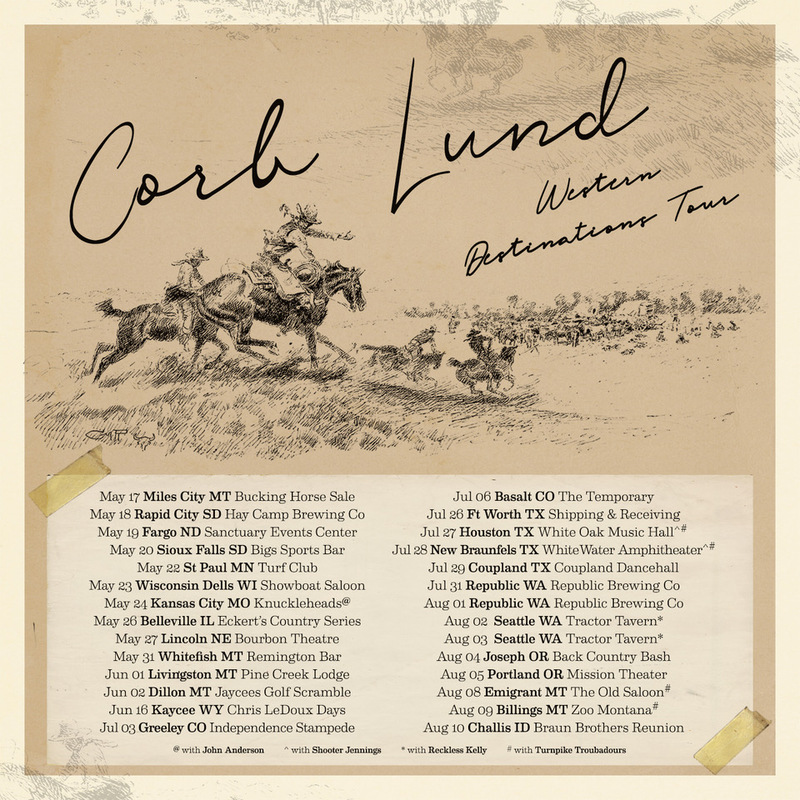 Corb embraces his Western heritage through his music, touching on a range of cowboy themes past and present — from rough-and-tumble tales of lawless frontier saloons, to the somber realities of running a modern family ranch. “When you come from generations of ranchers and rodeo people, you can’t help but be influenced by the west,” he says. “Western Destinations” also makes a handful of stops in Corb's native Canada, including the Centerfield Music Festival in St. Paul, AB on June 15; Rock the Shores in Colwood, BC, on July 14; and the Medicine Hat Exhibition and Stampede in Medicine Hat, AB, on July 25; with more dates to be announced in the coming weeks. Corb set the tone for the tour by personally selecting renowned Montana artist Charlie Russell’s sketch, “Coming to Camp at the Mouth of the Sun River,” as the centrepiece for the tour’s posters and supporting graphics. The award-winning singer has been praised by Rolling Stone Country, NPR, and the Washington Post, among others, and his music has been featured on the Netflix show The Ranch (including the forthcoming Season 3 premiere). Backed by his longtime honkytonk band, The Hurtin’ Albertans, Corb's live show is a force to be reckoned with. “Like Willie Nelson before them, they bring out the shitkickers and hipsters in equal measure," writes Vegas Seven. Corb's latest release, “Things That Can’t be Undone,” was produced by Grammy-nominated producer Dave Cobb (Jason Isbell, Sturgill Simpson) and further cemented his status as one of the best country singer/songwriters in the business. Tickets for “Western Destinations” tour dates are on sale now.